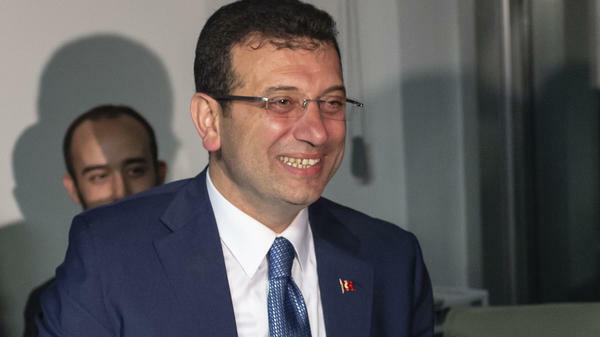 Opposition candidate Ekrem Imamoglu claimed victory in Istanbul's mayoral race even as results are still being reviewed. The city is where President Recep Tayyip Erdogan began his political career in the 1990s. Opposition candidates made serious gains in local elections in Turkey, winning a powerful post in Ankara and threatening to wrest other large cities away from President Recep Tayyip Erdogan's ruling party. In some areas, results remained too close to call. Sunday's elections, which took place nearly a year after Erdogan was re-elected to a new five-year term, are widely seen as a referendum on both Erdogan's leadership as well as his party's grip on power. "I would like to thank all my citizens, especially our Kurdish brothers, for showing sensitivity toward the issue of survival," Erdogan said as he claimed victory for his party, according to the Hurriyet Daily News. "As of tomorrow morning, we will start finding and making up for our shortcomings," Erdogan added, in a nod to the mixed results, during a post- election speech from a balcony in Ankara. Erdogan and his Justice and Development Party (AKP in its Turkish acronym) are tightly bound. He helped found the party in 2001, and it went on to a series of election victories. But the latest results suggest the party may be losing that momentum. "Overall, the ruling AK Party won a majority of the municipal contests, allowing Erdogan to declare victory," NPR's Peter Kenyon reports from Istanbul for our Newscast unit. "But in Ankara, secular opposition candidate Mansur Yavaş claimed a win." The AKP alleges that invalid votes and other problems marred the Ankara election, and the party is appealing to election officials to review the outcome. In filing an objection, the AKP's general secretary, Fatih Sahin, said via Twitter that the results don't reflect public opinion and the party is confident that the will of Ankara's voters will be reflected "in a healthy and accurate manner." The results of Istanbul's mayoral race have swung back and forth — with both candidates claiming victory in Turkey's largest city, where Erdogan launched his political career in the 1990s. As of Monday, the tally was leaning toward Ekrem Imamoglu of the Republican People's Party (CHP), who had a slim lead over the AKP's Binali Yildirim. Overall, 44 percent of Sunday's votes went to the ruling party, which won 15 metropolitan municipalities. CHP, the leading opposition party, got 30 percent and 11 such municipalities. Opposition candidates saw the most success in large cities. According to state-run Anadolu Agency, the CHP won the mayor's seat in Izmir, Turkey's third-largest city. Turkey's democratic institutions have been weakened under Erdogan's control, and the country's economy has increasingly struggled in recent years. A decade ago, the Turkish lira was worth more than 60 U.S. cents. Today, it's worth 18 cents. In Istanbul, voter Husnu Ozcetin told NPR's Kenyon that the election results reflect public fatigue after so many years with the AKP in power. "Everyone is tired, even AKP supporters," Ozcetin said, adding, "I never see them around, and yet somehow they seem to cast a lot of votes!" As voters cast ballot across Turkey on Sunday, at least four people died in election-related violence, including two who were shot after an argument broke out at a polling station, according to the Ahval news site. Despite the violence, Turkey's local elections "were conducted in an orderly way," said Andrew Dawson, leader of a vote-monitoring delegation from the Congress of Local and Regional Authorities of the Council of Europe. The European group sent observers to some 140 polling stations across the country, where monitors reported that ballot-box officials performed their tasks competently. The monitors also praised the high voter turnout — more than 84 percent — and the broad choice of political parties. Now, Dawson said in a statement, Turkish authorities "must allow locally elected representatives to exercise their political mandate — freely and without fear of accusations and repressions for supposed terrorist connections."